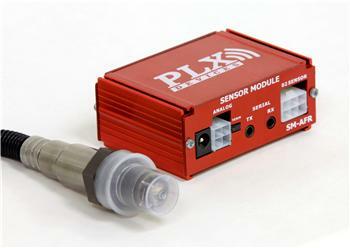 PLX Devices Sensor Module UNIVERSAL - Dezod Motorsports Inc - Home of the automotive performance enthusiast since 2002. All Sensor Modules are housed in high quality extruded aluminum designed to operate even in the most extreme conditions. In addition, all PLX Sensor Modules offer outstanding digital accuracy, response and resolution which far exceeds that of a standard gauge. Up to 32 PLX Sensor Modules can be daisy chained or be used as a stand alone unit capable of interfacing with 3rd party hardware. SM-Vac/Boost accurately measures the vacuum pressure and up to 3BAR of boost pressure of any intake manifold. This is ideal for turbo and supercharged applications with monitoring the intake pressure is vital. SM-AFR accurately measures the precise air/fuel ratio (AFR) of any internal combustion engine. Available with or without O2 Sensor. SM-EGT accurately measures the exhaust gas temperature or cylinder head temperature of any internal combustion engine. Any K-Type thermocouple is compatible. Available with or without EGT Sensor. SM-FluidTemp accurately measures the the temperature of any liquid. This is ideal for coolant temp, transmission temp, oil temp and any other fluid temp monitoring. SM-AIT accurately measures the air intake temperature of any intake manifold. This is ideal for intercooler, or aftercooler applications. Any K-Type thermocouple is compatible. Available with or without AIT Sensor.